In Russia generations of craftsmen have been developing techniques and traditions of woodcarving since olden times. Interest in this sculptural material was revived among professional sculptors in the 20th century. Works of art of such masters as Efimov I.S., Kardashev A.N., Ryndzyunskaya M.D., Churakov S.M. and Churakov S.S. (father and son), Sandomirskaya B.Y., Yakerson D.A., Balandin P.A. are honoured with exhibition in the collections of The Tretyakov Gallery. International Festival “Lukomorye” maintains and develops the traditions of Russian and foreign woodcarvers. The aim of the Festival is development of folk-crafts and landscape sculpture, exchange of experience of woodcarvers from different countries and regions, education of artistic taste of children, revival of interest in native history, creation of recreational area in the floodplain of the Oda River along the road to the unique mineral springs. 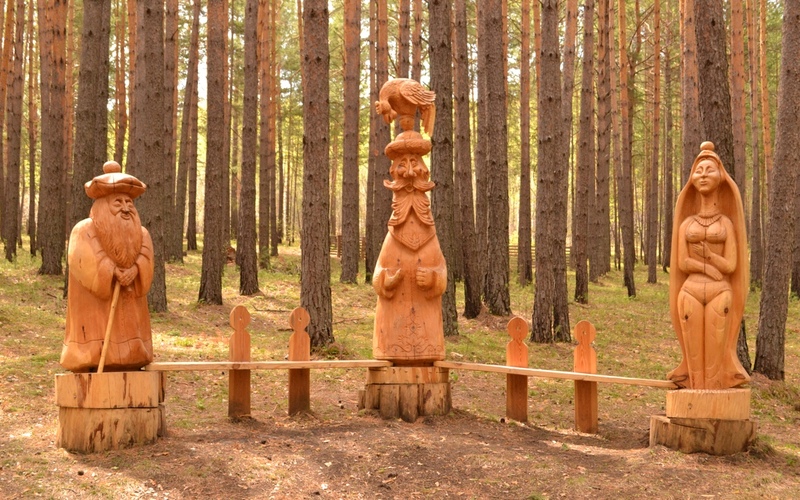 The magnificent wooden sculptures created by true masters are located in the pristine pine forest of «Lukomorye». Pushkin’s fabulous characters and Russian folk tales characters, which came to life due to magical craftsmanship of the best professional woodcarvers, peeping out through the trees, looking at adults and children with interest, watching over small paths of the wonderful forest, which were paved by Talking Cat or by Grey Wolf or by Red Fox. And maybe Chernomor with his knights are guarding the wonderful pine forest! 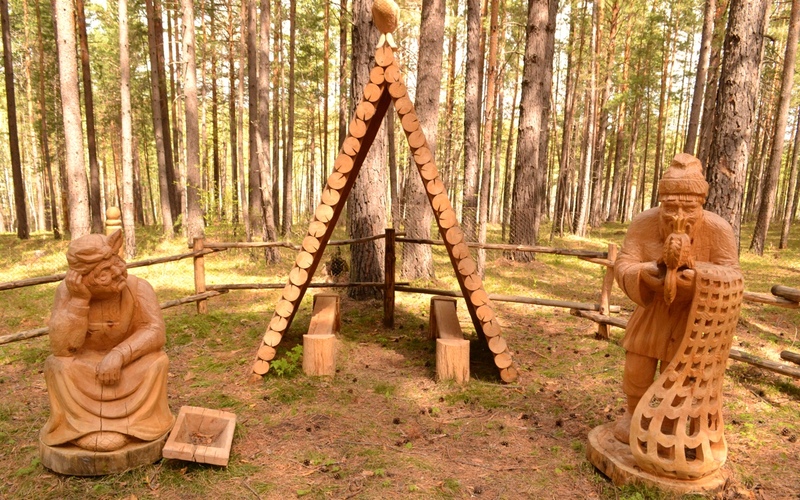 The theme of wooden sculptures is not confined to Russian folk tales only. Here you will find the wooden sculptures of herdsman’s playing patron, and Titan Prometheus, and lovely nymph Calypso, which appeared in «Lukomorye» right from the island Ogygia. Visitors are amazed by the wooden sculptures of giant centipede, scorpion, tarantulas, stag beetle, scarab beetles, wasps, ants, crickets, dragonflies, butterflies, and other representatives of giant insects and arachnids. On forest lawns you will find not only usual Siberian flowers such as zharki , landyshi, kukushkiny slyozki but also you will see truly wonderful flowers, which grow taller than a man, and they do not stop their flowering even in very strong Siberian frosts. The second festival – «Lukomorye» — 2012 took place in 2012 and was titled «Heroes of Hellas»12 teams were working on transformation of pine logs in mythical heroes of Ancient Greece from 15<sup>th</sup> - 25<sup>th</sup> of May. The result of the Festivals is a unique park of wooden sculptures (113 sculptures!) 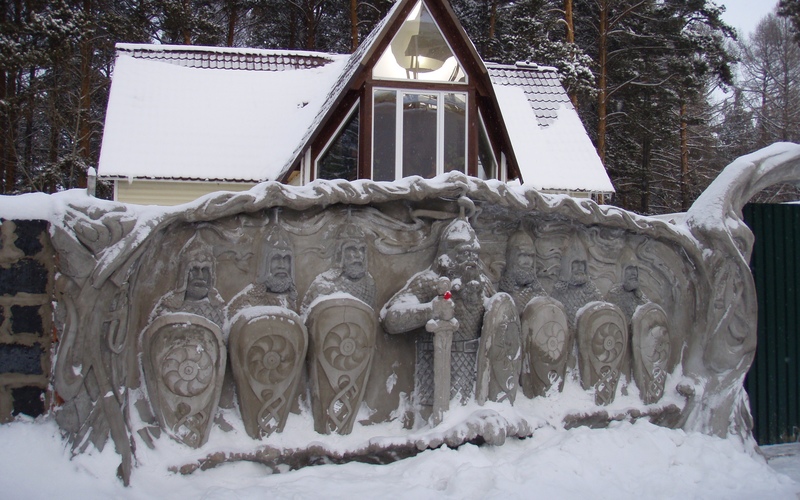 located in the picturesque foothills of The Sayan Mountains near living mineral springs under the crones of Angara pines in children’s recreation camp “Lukomorye”. Here everyone an adult and a child, can feel the origins of Russian soul, enjoy the beauty of pristine nature and creations of the great centuries-old art of wooden sculptures, feel the atmosphere of creativity and breathe fresh air of pine forest, fill your heart with the joy of unselfish human communication. The live soul of «Lukomorye» unites spectators and participants of the festival, gives wonderful positive emotions and remains in your memory forever. «Lukomorye» is not only an international festival; it is a real feast, which always with you! The 6th Festival Takes Place from 11<sup>th</sup> – 21<sup>st</sup> of May 2016.